A typical tree trimming or tree pruning service removes branches that are under-exposed to light, or cross, or rub together, and branches that do not aesthetically fit the general shape of the overall tree. Branches that are too close to electricity lines and branches that rub against roof-tops, are removed or trimmed to protect against damage to property and/or potential injuries. Dead, diseased, and broken tree branches are removed to improve the general health and aesthetic beauty of a tree. Tree trimming is often a preventative action to avoid a more costly problem in the future. Moreover, excessive tree growth can obstruct desired views of the scenery. A restored view with the help of tree pruning can increase the value of your property while still maintaining the integrity of your trees. In some cases though, a full tree removal is needed. 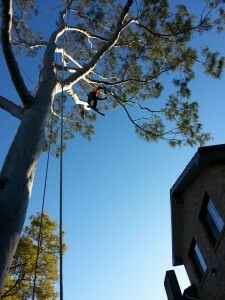 North Shore Tree King Tree Services provides tree trimming and tree pruning services to residential and commercial properties in Sydney Metropolitan area. Our experienced arborists perform pruning and trimming to industry approved standards, with utmost care for the health of your tree. With us you can be certain that the trees on your property will receive an accurate standard of care. We can also inform you of the best times for pruning your trees, to enjoy excellent results. Do not hesitate to ask our professional arborists for more information if you would like to receive an experienced opinion that will help you take a more informed decision. The members of our team complete our projects professionally, and all debris is neatly chipped on site and hauled away. Tree King staff take great pride in a complete clean-up after every project. Call us now on 04 04 04 33 33 and we will coordinate all of your tree trimming and tree pruning service, so you don’t have to.